Art Association of the Philippines will hold an On-the-Spot Painting Competition 2017 to be held on March 4, 2017 at GSIS Museum, The ATTIC Cafe, Event Planning and Catering in Pasay City. NOTE: Only the Top 3 Winners will become property of AAP. 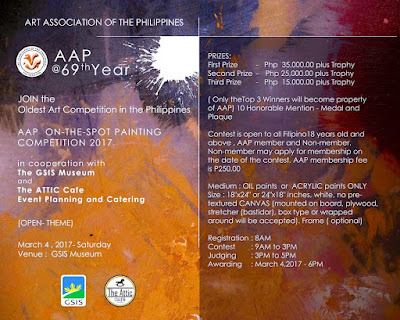 Contest is open to all Filipino 18 years old and above (AAP members and Non-members). Non-member may apply for membership on the date of the contest. AAP membership fee is Php 250.00.